O’FALLON – The students of OTHS are presenting The Hunchback of Notre Dame, Thursday, March 28 through Saturday, March 30 at 7 p.m. The Hunchback of Notre Dame follows the disfigured bell-ringer of Notre Dame Cathedral. His only friends are the gargoyles, until a young woman, catches his attention, who he then has to protect from the owner of the Cathedral. With opening night fast approaching, the students are putting in a lot of time after school to do run throughs of the play, from the opening scene to closing scene. “The high B flat is going to be an all-time high for me, so I am excited and nervous about singing at that pitch. I am however looking forward to the finale. 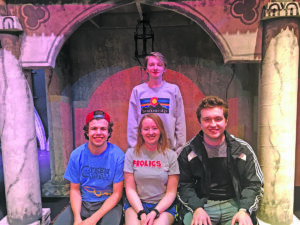 I think our play is more off of the book script then it is the movie script,” Bennett English, a senior at OTHS, said. English will be playing the Hunchback humself, Quasimodo. Tickets are sold online at $10 a ticket. The staff of the drama production recommends buying tickets online. If sold out online, no tickets will be sold at the door. OTHS hopes to see you there.